Enormous thanks to Kev Collier and everyone who has contributed, directly and indirectly, to this magnificently written account. Founded in 1909 by a local group of enthusiasts, the club’s first success came in 1913 when they won the local Wharfedale League. Following the end of the First World War the club switched to the Leeds League, achieving little until 1924 when another switch, to the West Riding County Amateur League, eventually brought success. A treble of league championships followed in the 1930s as well as two appearances in the last 16 of the old FA Amateur Cup, against South Bank in 1932 and Cambridge Town (now City) in 1934. 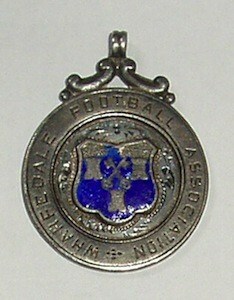 A fourth league title was won in 1939, after which seventeen years were to elapse before the fifth, achieved in 1956. It was followed by another switch, to the West Yorkshire League, which heralded a remarkable run of success in the local Wharfedale Challenge Cup, the trophy being won on nine out of ten occasions in the 1960s. Higher status was gained in 1968 with the club entering the Yorkshire League, and after moderate success the Division Two championship was won in 1976. Promotion to the First Division followed, with runners-up position achieved in 1980 along with a League Cup success over champions Emley. Success also arrived in the West Riding County Cup with a hat-trick of trophies won in 1979-80-81. 1981 also saw the club’s first taste of FA Vase mania, Guiseley reaching the quarter-finals before losing at home to eventual finalists Willenhall Town. Following the set-up of the non-league pyramid system in 1982, the Yorkshire League merged with the Midland League to form the Northern Counties East League, with Guiseley placed in the Premier Division at its inception. Moderate progress was again made, with third place achieved in 1985 and again in 1986. Off the field, the installation of floodlights in 1988 enabled the club to set its sights on achieving higher status. The 1989-90 season proved to be the springboard for a very successful period for the club, with the signing of the former England international Frank Worthington and a first FAVase Semi-Final appearance. Defeat against rivals Bridlington Town was soon forgotten as the following season saw the club go one better, not only reaching the famous Wembley twin towers but featuring in a never-to-be-forgotten 4-4 draw with Gresley Rovers. The trophy was won three days later with a 3-1 replay victory at Bramall Lane, Sheffield. Further success was achieved that season with a League and Cup double and promotion to the Northern Premier League. Another milestone in the club’s history was passed in 1991 with the First Round Proper of the F.A.Cup being reached for the first time, a 0-1 defeat to Football League Chester City at Macclesfield, their temporary home at the time. A further visit to Wembley in the FAVase sadly saw the trophy relinquished to Dorset side Wimborne Town. Spectators witnessed another eight-goal epic as the Lions went down 3-5. Good progress was made in the NPL, with fourth place achieved in the first two campaigns and the First Division Cup lifted in 1993. Under the guidance of Ray McHale, 1993-94 proved another exceptional season with the First Division title won, meaning promotion to the Premier Division. An even greater feat was to reach the semi-finals of the FA Challenge Trophy against Runcorn (then a Conference side), where only a stoppage-time goal in extra time of the second leg cruelly robbed Guiseley of a third Wembley appearance in four years. Consolation was gained by becoming the first Division One side to lift the NPL President’s Cup, defeating Leek Town over two legs. Elevation to the Premier Division saw the club gain a record-breaking 93 points and third position in its first campaign as well as reaching the first round of the FA Cup ,where a home tie against Carlisle United, switched to Valley Parade, produced a club attendance record of 6,548. Sadly, the latter half of the 1990s turned out to be something of an anti-climax, providing a sole West Riding County Cup win in 1996 and NPL. President’s Cup final defeats in 1996 and 1998. However, following the appointment of Bobby Davison as Player/Manager during the second half of the 1997-98 season a fresh impetus was provided as a number of the club’s promising young reserve players were blooded into the squad. A very creditable third place in the Premier Division of the Unibond League was achieved at the end of 1998-99 season, along with a first appearance in the Final of the League Challenge Cup. But fortunes took an unexpected turn for the worse the following season with relegation suffered for the first time in the club’s NPL membership, resulting in Davison’s being replaced by his assistant, Neil Parsley. 2002-03 provided an excellent FA Cup run when, despite languishing at the foot of the table, Guiseley achieved a fourth appearance in the First Round Proper of the competition with a visit to Second Division Luton Town. Although they suffered a 0-4 defeat, the cup run boosted the club’s finances as well as providing some memorable matches, notably the 3-2 replay victory at Tamworth. Season 2004-05 saw the club back in the Premier Division as a result of the restructuring of non-league football and the club gained its first silverware of the new millennium in the shape of the West Riding County Cup. Off the field the club saw its tie-up with local junior clubs bear fruition, with FA community club charter status achieved during early 2005. As a result, a new floodlit third generation surface all-weather training area to replace the old tennis court area adjacent to the ground was opened in September 2006. In November 2006, former Bradford City boss Terry Dolan arrived as manager and the Unibond League Chairman’s Cup was won, the Unibond League Fair Play award also being lifted for the second successive season although the much-coveted promotion to the Conference remained elusive. Steve Kittrick took over from Dolan in November 2007, but for a while the succession of near-misses continued, although April 2009 saw a run of wins including a first success in the Unibond Challenge Cup, a thrilling a 3-2 extra time victory over Ilkeston Town. The run, and the dream of promotion, ended only in a tense Play-off Semi Final defeat at Nantwich. The Club’s Centenary season in 2009-10 saw massive ground developments with a new stand, lights and terracing installed. Approaching the end of the season, Guiseley were in pole position to achieve elevation to the Blue Square North division after defeating promotion rivals Bradford Park Avenue twice in four days. Three defeats followed, however, one to rivals Boston, meaning that they went into the final game against Ashton United needing to win and for Boston’s and Avenue’s results to go their way. Guiseley ended up beating Ashton comfortably 2-0 while the other two dropped points, meaning the Lions were Champions and promoted to their highest-ever position in their centenary year. After a number of heart-stopping minutes between the final whistle and confirmation of the other results, the celebrations could begin. The 2010-11 season saw Guiseley make their bow in the Blue Square North and it went on to become the club’s most successful season. Despite losing their opening game to Nuneaton, the momentum that followed promotion propelled them to the upper echelons of the league table. Over the first half of the season, Guiseley’s league form was impeccable and led to a 19-game unbeaten run. The New Year began well with successive 1-0 victories over Harrogate Town and Hyde FC but the Lions entered their sticky patch at the beginning of March, going six games without a win until overcoming fellow-contenders Nuneaton away from home. Guiseley were picking up points again and achieved a fifth-place finish, putting them in the play-offs, three games away from back-to-back promotions. They managed to overcome Boston United in the first leg of the Semi-Final, thanks to a piledriver from Warren Peyton. It meant the Lions visited the Jakemans Stadium for the second leg full of confidence and dreaming of the Final. What followed was one of the most tense, thrilling and nerve-wracking encounters in which the club has ever been involved. Boston took the lead early on and maintained it till half-time. Shortly after the break, Gavin Rothery netted to put Guiseley back on top on aggregate before Anthony Church levelled just as Guiseley began to dream of the final. Extra time ensued, and when Darryn Stamp lashed the ball past Paul Bastock in the 108th minute Guiseley had one foot over the line. United had other ideas, however, and Danny Davidson headed past goalkeeper Steve Drench to send the tie to penalties. Guiseley triumphed thanks to penalties from James Walshaw, Stamp and Warren Peyton, along with two saves from Drench and the woodwork denying Adam Boyes. Guiseley were in the play-off Final. It would take place at the home of AFC Telford United, and once again it proved to be a rollercoaster of emotions. United started the better and took the lead through a controversial penalty but the scores were level shortly before half-time, James Walshaw keeping cool to fire home the equaliser from the penalty spot. An even first half had seen the sides go in at one apiece. Guiseley came out for the second period refreshed, and they were on top for large parts of the half. The pressure eventually paid off when Walshaw jinked down the left-hand side and stood up a cross for Darryn Stamp to head home, sending the away support into raptures. Guiseley were almost there. However, injuries and fatigue began to take their toll in what was a frenetic game, showcasing all that is good about non-League football, and all the while the home side kept plugging away at the Guiseley goal. The tide began to turn, and AFC Telford eventually broke through to equalise before going on to break Guiseley hearts with what was essentially the last kick of the game. The Lions had been eleven minutes from the top tier of non-league football. On top of their league achievements, Guiseley also enjoyed good runs in the FA Cup, where they eventually lost out to Crawley Town, and the FA Trophy, where they were edged out 1-0 by Luton Town. The one piece of silverware added to the Nethermoor cabinet was the West Riding County Cup, Thackley being overcome at Valley Parade. 2011- 2012 was another successful season with the team finishing as runners-up in the Blue Square Bet North, its highest ever league position, but it was followed by another play-off defeat, this time to eventual winners Nuneaton Town, although the West Riding County Cup was retained, a second stand was built, and further ground development took place as the club sought to strive for further elevation in the football pyramid. The following campaign saw the club rival Chester for top spot in the Skrill North but, once again, Guiseley were forced to settle for second place and the play-offs. Defeat to local rivals FC Halifax Town followed, 3-1 on aggregate, with the campaign also seeing the Lions relinquish the West Riding County Cup to The Shaymen. It proved Steve Kittrick’s final campaign in charge, with the long-serving Lions boss leaving Nethermoor in September after a difficult start to the season. Mark Bower was appointed interim manager although five consecutive defeats in the league followed. Regardless, Bower’s appointment was made permanent and when Danny Boshell returned as assistant, things started to pick up. A run to the FA Trophy third round followed as well as two lengthy unbeaten runs in the league that saw Guiseley once again reach the play-offs. Victory over North Ferriby United set up a final at Altrincham. Danny Forrest cancelled out James Lawrie’s opener but, with the final set to go to penalties, Greg Wilkinson proved Alty’s hero in the final minute of extra-time as the play-off curse struck again. Having seen plenty of positives from his side in his first season with the club, Bower reshuffled his squad going into his first full campaign at the helm. Adam Boyes signed permanently and, despite seeing the squad hit by injuries, Bower managed to take the club to the first round of the FA Cup as well as ensuring another crack at the play-offs. A convincing win over AFC Fylde set up a trip to Chorley although things appeared to be on course for further disappointment. Trailing 2-0 at half-time in the final, Bower switched his side’s style and it paid dividends in a half no Guiseley fan will forget. Boyes gave the Lions hope before Liam Dickinson and Nicky Boshell completed the most remarkable of comebacks to seal promotion to the Vanarama National League in style. “It’s a nice feeling. I got the job in September of last season with the brief of consolidating last season and getting promoted this time and that is those two boxes ticked,” Mark told the Yorkshire Evening Post. The first season in the National League saw us avoid the four relegation positions right up until the final two weeks of the season and only a last day victory over Torquay and defeat for neighbours FC Halifax Town saw Town relegated and us retain our National League status. Season 2016-17 started off badly for with five successive defeats and so the Board decided to dispense with the services of manager Mark Bower and his assistant Danny Boshell. Centre-back Adam Lockwood, the former Doncaster Rovers, Yeovil and Oldham Athletic player stepped in as caretaker manager, a move later made permanent. He then recruited former Doncaster Rovers manager Dave Penney as his assistant. This pair managed to avoid relegation in 2016-17 but a poor start to the 2017-18 campaign saw then replaced in September by former Barrow and Mansfield manager Paul Cox. Cox persuaded the club to go full time and brought in 18 new players to add to the 24 already with the club. After beating Accrington Stanley on penalties in an Emirates FA Cup First Round tie The Lions took up a place in the second round for the first time. The trip to Mansfield was a miserable one though as Cox’s side lost 3-0 with just 9 men. After the historic Emirates FA Cup run things did not work out, Cox was sacked in February and former Republic of Ireland centre-back Sean St Ledger moved up from playing to take the reins of a side bottom in the National League. What the Guiseley fans will be forever grateful to St Ledger for was the fact that he gave them back their club by bringing a feel-good factor back and re-uniting the players with the supporters. The season’s gloom was lightened by the success of its Academy team under the management of Dave Currie and the work of its award-winning Community Foundation. The Board appointed Guiseley’s first ever joint manager team for the start of the 2018-19 season when they installed former Solihull and Chester manager Marcus Bignott and former Alfreton Town manager Russ O’Neill, with former England C striker Paul Clayton as their assistant. The Joint Management Team guided the side to the second round of the Emirates FA Cup knocking out Cambridge United on route. Joey Barton’s Fleetwood Town side proved too strong though and edged through by two goals to one. 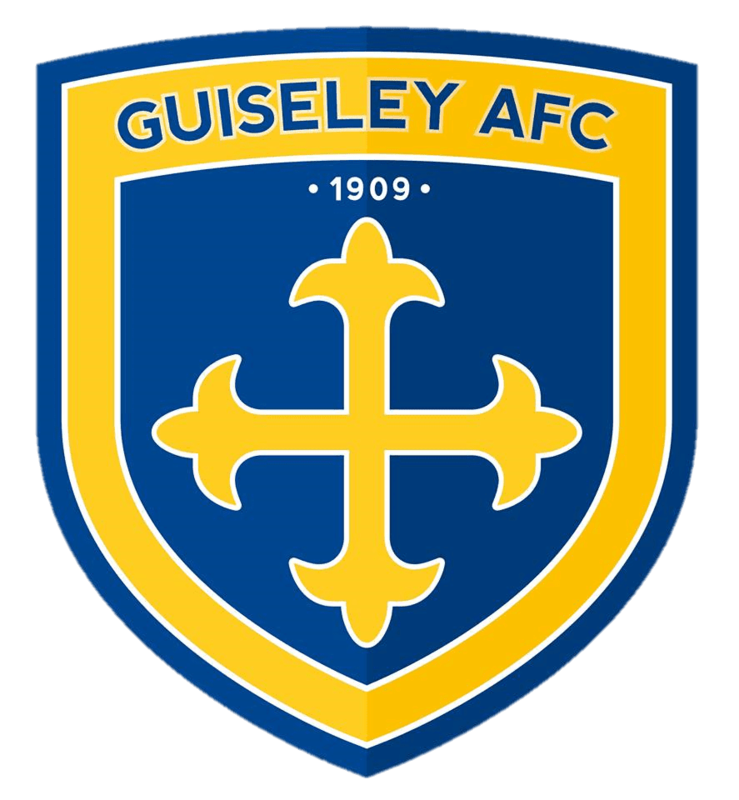 Guiseley Ladies Football Club was officially linked with Guiseley AFC in May 2005. The club affiliated to the West Riding Girls Premier League that season and successfully finished the year as champions. They gained promotion to the North East Division One South as a result. and subsequently achieved a long-term sponsorship deal with Peco Print and Embroidery Limited in Leeds. The ladies team attracted a host of players from the surrounding clubs, and continued their rise up the leagues by gaining a second promotion in as many years to the North East Regional Women’s Premier League. In 2007/08 the ladies played their first season in the North East Premier League, and finished a respectable fourth place. The club has gone from strength to strength, and with excellent coaching and management staff in place the club is aiming for National League status in a ten-year development plan. It will involve developing a reserve and development squad in that period. In the 2008/09 season, the team entered the Women’s FA Cup for the first time. They successfully beat off several teams to reach the second Round Proper. They were then knocked out by National League side Derby County Ladies FC, but their achievement earned them the ‘Team of the Round’ Award from The Football Association, now proudly displayed in the clubhouse. Following the fantastic FA Cup run, the team then reached the County Cup semi-Final where they met Leeds Carnegie Ladies FC. This fixture proved to be a bridge too far, although the ladies gave a solid and determined performance. The club welcome any players interested in playing for the club. Alternatively, if you are a volunteer and interested in becoming involved in any of the committee positions at the club, including the new fundraising officer role, please email or telephone the club secretary anytime.